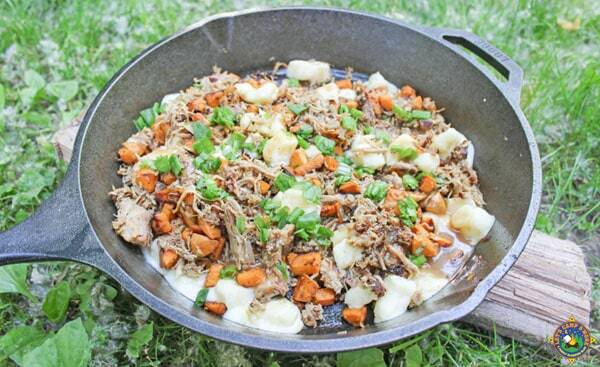 Create poutine with pulled pork on top in a cast iron skillet. Cheese curds, oh my gosh! What’s better? Put them on french fries and smother them in gravy, I’m talking about Poutine. We first had these amazing cheese fries in Canada, but we eat them every time we go to Madison. We adore these smothered fries, but how do you make it better? 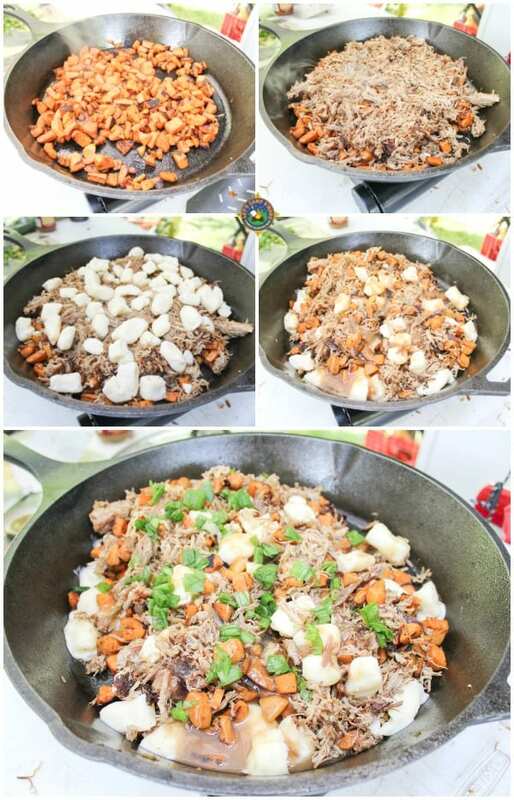 Add meat; here is how we roll with our Camping Poutine. We make ours with sweet potato, but it can be made with regular potatoes or even frozen french fries. This recipe is pretty easy! 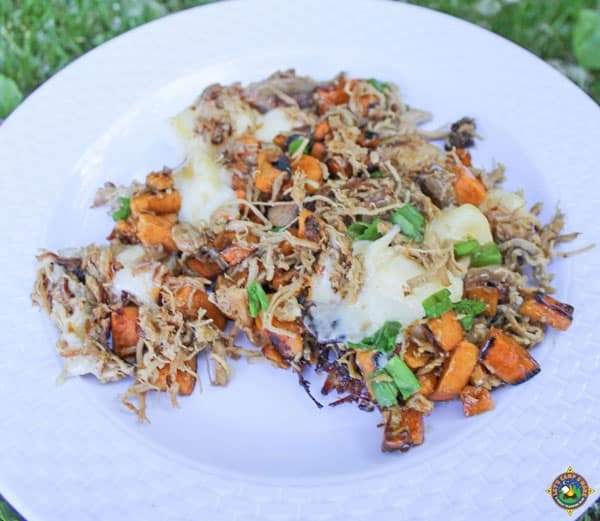 You need sweet potatoes, regular potatoes, or french fries, olive oil, premade pulled pork, cheese curds, gravy and green onion. We purchased packaged pulled pork that we headed up, but this would work well with leftover or takeout pulled pork. Peel and chop the sweet potatoes. We cubed ours. Add some olive oil to a cast iron skillet and cook the sweet potato, stirring frequently. While the sweet potatoes are cooking, heat up the pulled pork according to the directions. When the sweet potatoes are cooked to the desired crispiness, layer.the pulled pork on top. Layer the cheese curds on top of the pork. Chop up a few green onions and place on top. The heat from the skillet will melt the cheese curds a little bit. The campfire poutine was so delicious and we devoured it. 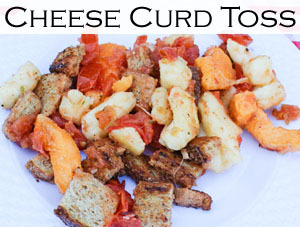 We will make this each time we camp in Wisconsin because that is where you get the best cheese curds. Seriously! We have a few grocery stores in town that sell puny bags of cheese curds, but they are not very good because they don’t squeak when you bite into them. Do you know what I mean? 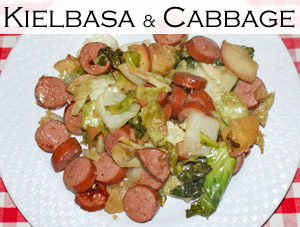 We cooked this in a cast iron skillet on a burner while camping, but it can be made at home too! Have you ever had poutine? Chop up a few green onions and place on top of the poutine. I love the flavor combination for your great dish! Hope you are having a great week and thanks so much for sharing your awesome post with us at Full Plate Thursday! Can you believe that I have never had poutine? I love pulled pork though so I will have to try this recipe!